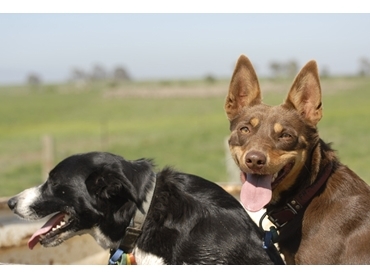 Virbac Animal Health recommends proper management of worms in working dogs to ensure peak performance in protecting livestock. Dr Mark Kelman, Technical Services Manager for Virbac explains that proper worm management in working dogs can have a direct impact on a producer’s bottom line. An essential but sometimes underestimated factor in sheep operations, proper worm treatment will ensure producers not only get the benefits of their canine’s peak performance but they also protect their livestock – and themselves – against worms that can be passed on by their dogs. Dr Kelman says that dogs with worms can’t work to their full potential, and a high worm burden even has the potential to kill dogs, particularly those that are more susceptible, like young pups, by causing severe anaemia or obstructions. Of particular concern to producers is the high probability of some dog worms such as dog tapeworm Taeniaoivs and hydatid tapeworm Echincoccusgranulosus transmitting to sheep via infected pasture, leading to production losses as abattoirs must trim or condemn affected carcases depending on the number of cysts found. Dog tapeworm larvae form cysts in muscle meat, known as sheep measles, while hydatid tapeworm larvae form cysts in major organs such as the liver and lungs. Not only can sheep pick up these tapeworms from pasture contaminated by working dogs, dogs can also be re-infected by eating or scavenging on contaminated sheep meat or offal. In the case of the hydatid tapeworm, infection can also be spread to humans through contact with affected dogs or tapeworm eggs, causing a serious disease known as Hydatids, where cysts form in a person’s vital organs. However, regular dosing of dogs using specialist canine worming products such as Virbac’s Endogard or Canimax can keep these worms in check cost-effectively. Endogard and Canimax treat the full spectrum of intestinal worms in dogs such as roundworm, hookworm, whipworm and tapeworm including dog tapeworm and hydatid tapeworm. Both Endogard and Canimax are based on the active ingredients praziquantel for tapeworms and oxibendazole for all other intestinal worms, keeping selection simple. Canimax has an additional active ingredient, abamectin, which prevents the heartworm Dirofilariaimmitis. Endogard is a great choice for producers requiring only intestinal worm control, while Canimax is the perfect choice for producers looking for complete prevention and treatment of both heartworm and intestinal worms. Endogard can be administered once per season (four times per year); however a six-week treatment cycle is recommended for optimal protection against dog tapeworm and hydatid tapeworm. Canimax should also be administered at least every six weeks to ensure ongoing protection against heartworm.